Spring is a great time to visit a Nature Preserve. Photo by Thomas G. Barnes. Across the Commonwealth there is an abundance of sites that are either funded, in partnership or controlled by the Kentucky State Nature Preserves Commission (KSNPC) and available to the public for hiking and enjoying nature. The sites listed below are funded in part by the purchase of “Nature’s Finest” license plates. The purchase of a bobcat, cardinal or butterfly license plate designates $10 to the Kentucky Heritage Land Conservation Fund (KHLCF) which is administrated by the KSNPC to help buy and manage land for both hiking trails and habitat conservation across the state. The following are our top 10 Nature Preserves to visit this spring. Covering 268 acres in Jessamine County, Camp Nelson is a significant historic site best known for its role as a recruiting and training center for black Union soldiers during the Civil War.. In addition to its historic interests, the site has a hidden jewel located in the back of the area where the Fort Jones Trail enters the only heavily wooded section with breathtaking overlooks of the Hickman Creek valley below. For more information on the preserve and their mission, please visit http://heritageland.ky.gov/Pages/CampNelson.aspx. Mayapples and trillium at Camp Nelson. Photo by Thomas G. Barnes. Trout lily and phlox at Camp Nelson. Photo by Thomas G. Barnes. You will find restored wetlands, native grassland habitats and a bit of history at Tebb’s Bend, located near Campbellsville, Kentucky. This 185-acre site situated at a mile-long stretch of the Green River, offers several miles of trails that are available to the public. Common bird sightings at the area include blue herons, wood ducks and prothonotary. For more information and directions to the site, please visit http://heritageland.ky.gov/Pages/TebbsBend.aspx. One of the many beautiful sights you will see at Tebb’s Bend. Photo by Zeb Weese. An old bridge at Tebb’s Bend. Photo by Thomas G. Barnes. With at least seven natural communities, this spectacular site boasts forested bluffs, a riparian forest, a bald cypress slough and a mesic ravine forest and a bottomland hardwood forest. A rookery for the great blue heron can be found in the bottomlands along a tributary of the Cumberland River, Bissell Creek. The preserve is open to the public from dawn to dusk for hiking, nature study and fishing. For more information please visit http://naturepreserves.ky.gov/naturepreserves/Pages/bissell.aspx . Bissell Bluff in Livingston County. Photo by Zeb Weese. One of the last wetlands in Northern Kentucky can be found along the Ohio River in Campbell County. This 146-acre area, open for hiking, bird viewing and educational purposes, contains native species such as Jefferson Salamanders and wood frogs. For more information and directions to the preserve please visit http://heritageland.ky.gov/Pages/StAnneWoods.aspx for more information. A gray tree frog camouflages itself at St. Anne’s Woods and Wetlands Heritage Park. Photo by Thomas G. Barnes. At St. Anne’s Wetlands a green tree frog hangs out on land conserved by citizens of the Commonwealth. Photo by Thomas G. Barnes. Although the National Park Service has operated Lincoln’s birthplace for decades, Lincoln’s Boyhood Home was acquired a few years ago by the KSNPC. This site includes two miles of hiking trails that wind to the top of a forested knob with a view of the valley below. Please visit https://www.nps.gov/libo/index.htm for more information. At Lincoln’s Boyhood Home redbuds in bloom in a valley. Photo by Thomas G. Barnes. Located in the capital city of Frankfort, Cove Springs Heritage Park has something to offer everyone. With over two miles of trails spread over 250 acres, the main area hosts a waterfall, picnic area and access to an adjacent city park that offers a running track, restrooms, an archery track and a breathtaking overlook of Frankfort. The site also hosts a restored wetland with amphibians, waterfowl, and native wildlife. Forested areas are home to native flora, including the Braun Rockcress, a federally endangered plant. For more information and directions, please visit http://heritageland.ky.gov/Pages/CoveSprings.aspx. Cove Springs Park entertains visitors with many sites. One is Hurst Falls. Photo by Thomas G. Barnes. This 3,509-acres preserve, located in Harlan County, is one of the largest remaining old-growth forest in the eastern United States. Lauded as an ecological treasure, it contains several forest communities, including mountaintop wetlands and a mixed-mesophytic deciduous forest. Many of the mature trees on site measure three to four feet in diameter and some dating back to the late 1600s’, ecologists can find species such as sugar maple, tulip poplar, various oaks, hemlocks, beech and magnolias..
Two trails offer hikes through 4.5 miles of the preserve. One trail, rated as moderately strenuous, is four miles long and offers a bird’s eye view of the forest and Watts Creek and Bad Branch watersheds. A less strenuous trail offers a scenic half-mile alternative. Both trails feature various native wildlife and plants. Some caution should be taken at this site as there are steep slopes and possibly venomous snakes. Hiking, birding, nature photography and research is available year round. For more information please visit http://naturepreserves/Pages/blanton.aspx. A bluff overlooks Blanton Forest. Photo by Zeb Weese. Blanton Forest State Nature Preserve in Harlan County displays old growth beech and hemlock. Photo by Thomas G. Barnes. 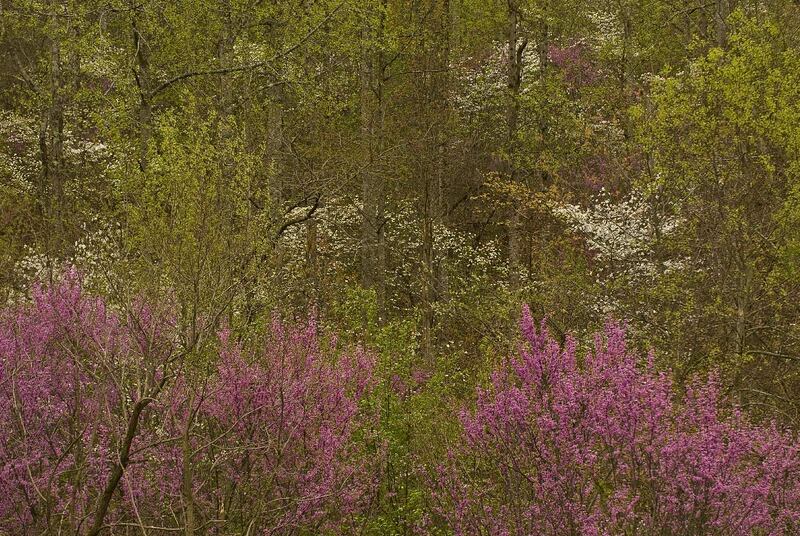 This 2,785-acre preserve in Letcher County protects not only one of the most significant and beautiful natural areas in Kentucky, but also one of largest concentrations of rare and uncommon species known in the state. Featuring a foot trail and bridges over five miles of trail, thisstrenuous hike takes you through a forested hemlock gorge, to a 60-foot waterfall, a high-quality stream, watersheds and finally a trail along a mountain crest. Rare plants and animals can be seen, as the preserve has Kentucky’s only known nesting pair of common ravens (Corvus corax) residing onsite. For more information on Bad Branch please visit http://naturepreserves/Pages/badbranch.aspx. Bad Branch High Rocks is a popular spot with visitors. KSNPC photo. Bad Branch offers guided hikes to inform the public of what the preserve has to offer and what it also protects. KSNPC photo. Waterfalls, scenic views and flora and fauna are only a few of the fabulous things this highly renouned preserve holds for visitors. Encompassing 1,294 acres within Cumberland Falls State Resort Park in Whitley and McCreary counties, this preserve features the 67-foot Cumberland Falls and the Cumberland River which is designated a Kentucky Wild River. Four-and-a-half miles of trail take visitors over uneven terrain for hiking, study and bird watching. The acreage of the nature preserve is set aside for the management and study of rare, threatened or endangered species and communities. For more information on the preserve and their mission, please visit http://naturepreserves.ky.gov/naturepreserves/Pages/cumbfalls.aspx. Cumberland Falls is a popular destination for outdoor enthusiasts. Photo by Jay Hamon. Take a hike back in time at Lower Howard’s Creek Nature and Heritage Preserve located in Clark County. This preserve is a glimpse into the 18th and 19th centuries, as the site served as an industrial center for water-powered stone milling. Five registered historic buildings still stand on the grounds along with original rock fences and a wagon road that winds down into a steep forested gorge. The preserve hosts several species of rare and threatened plants and wildflowers that grow along the steep topography located on the more than 400 acres of twisting gorge, second-growth forests, and cliff tops. More information and directions to the preserve can be found at http://naturepreserves.ky.gov/naturepreserves/Pages/lowerhowardscreek.aspx. One of the many scenic views that you will find at Lower Howard’s Creek. Photo by Zeb Weese. For more information and directions to these Nature Preserves and others located across Kentucky, please visit http://naturepreserves.ky.gov/naturepreserves/Pages/preserves.aspx. You can also visit KSNPC’s Facebook page for information on guided tours and trips at https://www.facebook.com/KentuckyNaturePreserves/.